Safe To Semi is an Arizona punk rock band from Mesa, Arizona. Their sound has been described as “…aggressive, driving, punk rock”. 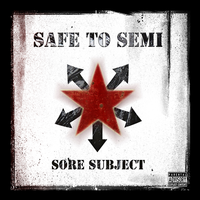 Safe To Semi has just completed its debut record, “Sore Subject”, which features songs which range in topics about life, death and failed relationships. Better than most emerging bands today. Wonderful! About time with the new album. miss ya last time you guys played look forward in seeing guys again.